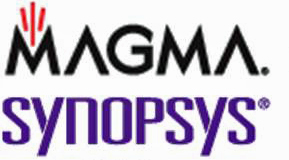 Magma details a shotgun marriage to Synopsys, after a 10-month courtship and wooing of Cadence. Last year, the biggest news in the EDA industry broke on November 30th, when Magma announced that they had agreed to be acquired by Synopsys for $507M - equivalent to $7.35 per share. Thanks to SEC disclosure requirements for publicly traded companies, we now know that discussions started much earlier, on February 2, 2011, and that it was Synopsys that initially approached Magma. The details of the negotiations in Magma's preliminary proxy statement provide an intriguing behind the scenes peek at EDA M&A activities, while also providing material that will be examined in great detail for comparison to the previous public record of remarks in the company's SEC filings during the same negotiation period. we have held discussions from time to time (prior to the timeline described below) with various companies, including Synopsys and a publicly traded company in our industry we refer to as Party A, that expressed preliminary interest in pursuing a potential acquisition of our company. However, except as described below, none of these discussions resulted in a firm indication of interest in acquiring our company. Veteran EDA observers would likely conclude that "Party A" is Cadence Design Systems. On February 2, 2011, in a meeting initiated by Dr. Aart de Geus, Synopsys’ Chairman and CEO, Mr. Madhavan and Roy Jewell, our President and Chief Operating Officer, met with Dr. de Geus and Dr. Chi-Foon Chan, Synopsys’ President and Chief Operating Officer, regarding a potential acquisition of our company by Synopsys. At this meeting, the parties reviewed certain publicly available information regarding our company and discussed at a general level potential synergies from a combination of the companies. As a result of the early February 2011 meeting, Magma's board decided to retain "Qatalyst Partners to act as our financial advisor in connection with our consideration of potentially pursuing a sale transaction." From February 2011 through April 2011, Mr. Madhavan and Mr. Jewell had periodic communications with Dr. de Geus and Dr. Chan with respect to a potential acquisition of our company by Synopsys. Those discussions did not progress beyond general expressions of a mutual interest in exploring a potential acquisition of our company by Synopsys. While it would appear from the Compensation Committee's remarks that things were looking up for Magma, by August 29th, when these executive raises were disclosed, the stock had fallen to below $5 per share. Behind the scenes, at the same time as raises went into effect for Magma's CEO, CFO, and COO, the Magma Board had decided to actively pursue a buyer as and exit the "improved market". On April 26, 2011, we contacted representatives of Party A to gauge their interest in a potential acquisition of our company. On May 11, 2011, we entered into a mutual non-disclosure agreement with Party A. On May 13, 2011, Mr. Madhavan; Peter Teshima, our Corporate Vice President, Finance and Chief Financial Officer; Greg Wagenhoffer, our Vice President, Finance — Corporate Development and Treasurer; and representatives of Qatalyst Partners met with representatives of Party A. At this meeting, the parties reviewed certain publicly available information regarding our company and discussed at a general level potential synergies for a potential acquisition of our company by Party A. On May 19, 2011, a representative of Party A contacted representatives of Qatalyst Partners and stated that Party A was not interested at that time in a potential acquisition of our company. In mid-May 2011, the discussions between us and Synopsys terminated, as the parties were not able to progress those discussions beyond general expressions of a mutual interest in exploring a potential acquisition of our company by Synopsys. In mid-May, Magma's executives and their financial advisors offered the company to competitors, but they were unsuccessful in finding a taker. Magma then decided to pursue a different strategy. Beginning in July 2011, we had discussions initiated by a private equity firm about a potential business combination involving the private equity firm; a potential third party, which was a publicly traded company in our industry, which we refer to as Party B; and our company. On July 8, 2011, Mr. Madhavan, Mr. Wagenhoffer and representatives of Qatalyst Partners met with the private equity firm to discuss the potential business combination involving the private equity firm, Party B, and our company. On August 5, 2011, the private equity firm proposed the potential transaction to Party B. At such time, representatives of Party B determined that Party B was not interested in a potential business combination with our company. Speculation here is that Party B was Mentor Graphics, and that they also decided not to pursue an acquisition of Magma. 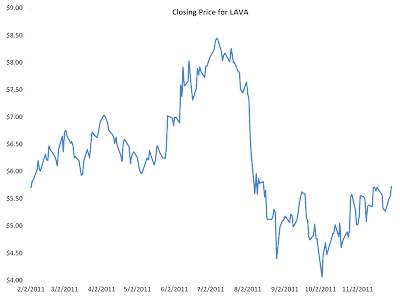 Having struck out with each of their larger EDA competitors, and with LAVA now trading back down in the range of $4.50-$5.50, compay executives circled back. On August 29, 2011, Dr. Chan and Mr. Jewell met to discuss Synopsys’ interest in re-opening discussions regarding a potential acquisition of our company. On September 16, 2011, Dr. Chan and Mr. Jewell met again to continue the discussion begun on August 29, 2011. On September 21, 2011, representatives of Qatalyst Partners spoke to Dr. Chan, and Dr. Chan confirmed Synopsys’ interest in acquiring our company. Dr. Chan and the representatives of Qatalyst Partners also discussed next steps to continuing these discussions, with the representatives of Qatalyst Partners requesting that Synopsys provide us with a non-binding indication of interest with respect to a proposed transaction. This time, in September, the negotiations resulted in a preliminary offer. On September 27, 2011, Dr. Chan conveyed to representatives of Qatalyst Partners a preliminary and non-binding oral indication of interest from Synopsys to acquire our company at a price of $6.60 per share in cash. This first offer from Synopsys, on September 27, 2011, was equivalent to $1.57 above that day's $5.03 closing price LAVA. On September 29, 2011, representatives of Qatalyst Partners contacted Party A to solicit interest in a potential acquisition of our company. Also on September 29, 2011, representatives of Qatalyst Partners attempted to contact representatives of a publicly traded developer and marketer of engineering simulation software and technologies, which we refer to as Party C, to solicit interest in a potential acquisition of our company. Apparently, having seen the success that Apache Design Solutions had in selling to "a publicly traded developer and marketer of engineering simulation software and technologies" on June 30, Qatalyst also decided to try approaching ANSYS, as well as once-again testing Cadence's interest. Not surprisingly, ANSYS expressed no interest. On September 30, 2011, representatives of Qatalyst Partners contacted Party C to solicit interest in a potential acquisition of our company. Party C responded on October 3, 2011 and advised a representative of Qatalyst Partners that it was not interested in pursuing a transaction with our company. For their part, while Magma pursued a competitive offer from Cadence, Synopsys took action to avoid getting caught up in a bidding war. On October 4, 2011, Mr. Madhavan, Mr. Jewell and Mr. Wagenhoffer met with representatives of Party A to discuss whether Party A would be interested in a potential acquisition of our company. On October 5, 2011, Dr. Chan sent an email to Mr. Madhavan in which he stated that he was prepared to deliver a written indication of interest to us provided that we sign a short form confidentiality agreement pursuant to which we would agree to keep the indication of interest confidential. Following our execution of this confidentiality agreement, we received from Synopsys a preliminary and non-binding written indication of interest to acquire our company at a price of $6.60 per share, subject to the satisfactory completion of Synopsys’ due diligence. Along with this indication of interest, we also received from Synopsys a draft exclusivity agreement, pursuant to which Synopsys requested that we agree to exclusive negotiations with Synopsys. Also on October 5, 2011, at a special meeting of our board of directors, our management and representatives of Qatalyst Partners reviewed for our board of directors the preliminary and non-binding written indication of interest and draft exclusivity agreement that had been provided to us earlier in the day by Synopsys. Representatives of Qatalyst Partners noted that with respect to their discussions with representatives of Synopsys regarding transaction price, Synopsys had stated its view that the proposed price of $6.60 per share represented a substantial premium to the then current trading price of our common stock. Our board of directors had determined, after consultation with our management and Qatalyst Partners, that Synopsys, Party A, Party B and Party C were the most likely strategic buyers of our company due to their size and presence in our industry. On October 7, 2011, the chief financial officer of Party A contacted representatives of Qatalyst Partners and advised them that Party A was not interested in pursuing an acquisition of our company. On October 8, 2011, at a special meeting of our board of directors, ... After our management and representatives of Qatalyst Partners updated our board of directors regarding the discussions with Party A, Mr. Madhavan advised our board of directors that he would attempt to have a follow up conversation with the chief executive officer of Party A to see if he could get more context for Party A’s unwillingness to engage in discussions regarding a potential acquisition of our company. While Magma's outside legal counsel advised that Synopsys' offer of $6.60 was too low. Representatives of O’Melveny & Myers LLP, our outside legal counsel and to whom we refer as OMM, then presented to our board of directors a draft term sheet that it had prepared with our management and Qatalyst Partners for delivery to Synopsys as a proposed response to Synopsys’ preliminary and non-binding written indication of interest. Among the terms included in the draft term sheet was a proposed price per share of $8.20 in cash as well as a proposed termination fee of $70 million in favor of our company in the event the transaction was terminated as a result of the inability of the parties to obtain the required regulatory approvals. At the conclusion of this meeting, our board of directors approved the draft term sheet and authorized our management and Qatalyst Partners to provide the term sheet to Synopsys and negotiate with Synopsys with respect to any revisions that might be proposed by Synopsys. While Magma's advisors prepared to present their term sheet to Synopsys, Rajeev continued to court Cadence. On October 11, 2011, representatives of Qatalyst Partners had a call with Dr. Chan in which the representatives of Qatalyst Partners reviewed for Dr. Chan the terms in the draft term sheet. Following the call, Qatalyst Partners delivered to Dr. Chan the draft term sheet. On October 13, 2011, Mr. Madhavan called the chief executive officer of Party A, who confirmed that Party A was not interested in pursuing an acquisition of our company. Two weeks later, Synopsys attempted to close the deal by increasing their offer. On October 25, 2011, representatives of Qatalyst Partners had a call with Dr. Chan regarding Synopsys’ response to the draft term sheet. On that call, Dr. Chan stated that Synopsys remained interested in pursuing an acquisition of our company, but not on the terms we had proposed in our draft term sheet. Dr. Chan stated that Synopsys would increase its price per share from $6.60 to $6.85 and that Synopsys was willing to agree to a $25 million termination fee, but that Synopsys was unwilling to undertake certain other obligations with respect to obtaining regulatory approval. At this point, Magma had run out of alternative EDA buyers, and their management concluded that the economic environment further limited their options. On October 27, 2011, at a special meeting of our board of directors.. Representatives of Qatalyst Partners then reviewed for our board of directors the third parties that our management or Qatalyst Partners had approached to date, consisting of Party A and Party C, as well as the rationale for not engaging with Party B, which was principally the belief of our management and Qatalyst Partners that Party B did not have the interest or financial ability to make a competitive bid for our company. Representatives of Qatalyst Partners also provided their views regarding the potential for private equity firms to make a competing bid for our company. In particular, Qatalyst Partners noted that it considered this to be a low probability due to, among other things, the limited opportunities for a favorable future liquidity event that would generate the returns that it believed private equity firms would find interesting, the current economic environment, which it believed would make even more challenging the substantial debt burden that a traditional private equity bidder would need to incur, and its belief that private equity bidders would not enjoy the same potential synergies that a strategic bidder would. The views of Qatalyst Partners were consistent with the existing views of our management and our board of directors. At this point, negotiations turned into a ping-pong game over price, but Magma was still extremely reluctant to sell out to Synopsys and approached Cadence one last time! On November 1, 2011, Synopsys provided to us a markup of our October 11, 2011 draft term sheet, reflecting the proposed per share merger consideration of $6.85, a termination fee in our favor of $25 million, and Synopsys’ response to the other terms set forth in our draft term sheet. In addition,...Our board of directors also directed Qatalyst Partners to contact Party A and see if it would be interested in discussing an acquisition of our company at a price of $7.30 per share plus the proceeds from the proposed disposition to Party D or another third party of a non-core business unit. On November 2, 2011, a representative of Party A contacted Qatalyst Partners to notify Qatalyst Partners that Party A was not interested in pursuing an acquisition of our company at that price. On November 9, 2011, representatives of Qatalyst Partners spoke with Dr. Chan, who stated that he believed the parties were at an impasse on price. As a result, Dr. Chan stated that Synopsys was now prepared to terminate negotiations. The representatives of Qatalyst Partners recommended that both sides consider a price per share of $7.35, with no separate component for the proceeds from the proposed disposition of a non-core business unit. Dr. Chan agreed to discuss that proposed price with his team, and the representatives of Qatalyst Partners agreed to review this revised price with our management. Dr. Chan called representatives of Qatalyst Partners later that day and conveyed to Qatalyst Partners that Synopsys’ business team had met internally and that Synopsys was willing to increase its per share merger consideration offer to either (a) $7.35 with a $30 million termination fee in our favor, or (b) $7.30 with a $35 million termination fee payable in our favor. On November 10, 2011, at a special meeting of our board of directors... Representatives of Qatalyst Partners also noted that the $7.35 price per share represented a significant premium to the closing trading price of our common stock on November 9, 2011 and a significant premium to the 30 trading-day average closing price of our common stock (ending on November 9, 2011). 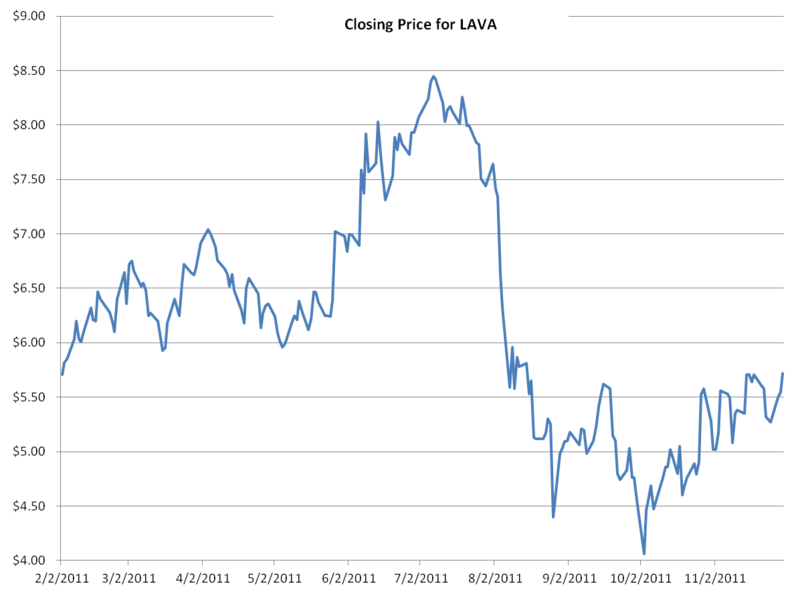 On November 9, 2011, LAVA shares closed trading at $5.08. Now that there was an agreement on price, the lawyers and advisors got together to put a bow on the package. On November 29, 2011, the Synopsys board approved the merger and the merger agreement at a special meeting and determined that the merger was in the best interests of Synopsys and its stockholders. On November 30, 2011, at a special meeting of our board of directors, representatives of OMM reviewed for our board of directors the revisions to the merger agreement from the version discussed at the November 29, 2011 board meeting. Qatalyst Partners then reviewed the basis for its proposed fairness opinion and rendered to our board of directors its oral opinion (which was subsequently confirmed in writing on November 30, 2011) that, as of such date and based upon and subject to the considerations, limitations and other matters set forth therein, the $7.35 per share cash consideration to be received by the holders of Magma common stock ... pursuant to the merger agreement was fair, from a financial point of view, to such holders. So, on October 8th, when LAVA shares had last traded at $4.47 on the previous day, $8.20 was considered a fair price. On November 30, when LAVA had closed more than $1 higher at $5.55 the previous day, Magma management concluded that $7.35 was a fair price to sellout to Synopsys. Magma's diary shows that management became intent on selling the company in late August, at the exact same time as they were painting a picture of an improved financial position and an improved market overall. Negotiations such as these can gather momentum that drives inevitability, and clearly Magma pushed Synopsys as far as they thought they could on price. But, it is also apparent that Synopsys was not Magma's preferred choice for marriage. It is likely that the accumulating lawsuits regarding the sale price will lead litigants to ask why Magma did not just walk away if their prospects (as stated) were upbeat. Short term thinking appeared to takeover, and the final selling price was just $1.63 over the last day's trading when announced, pretty much the same premium as when Synopsys had first offered $6.60 per share. Cadence's lack of interest in pursuing the acquisition is also an issue that their shareholders may rightfully question. While it certainly would have been more challenging for Cadence financially, allowing the competition to go to Synopsys pushes Cadence that much further into second place in a number of areas. If the acquisition is approved by federal regulators, Synopsys will have added more products to their market-leading digital implementation suite, and to their horde of FastSPICE simulators. Both of these product lines would have benefited Cadence more than Synopsys.